Even the most experienced programmers can be caught unawares by software they've used for years without trouble. Dino Esposito explains why and how the JSON method in an ASP.NET MVC controller class suddenly started to cause an exception on a production server, and how he fixed the problem. In the ASP.NET space, most Web Forms solutions rely on WCF services to expose JSON data because WCF was, in the past, the only way to attach services to Web Forms solutions. Those Web Forms applications that were recently written, or significantly restructured, probably use Web API to expose HTTP-callable endpoints. If you already have WCF around, stick to that for your Web Forms. Otherwise, reference the Web API infrastructure and start adding Web API controllers to the solution. To be picky, you should avoid mixing WCF and Web API frameworks together. This is not because of well or little known incompatibilities. More simply, it’s just to prevent the footprint of your application from growing too large. When it comes to ASP.NET MVC, however, the decision is more confusing. You still have two main options, but the distinctions between them are blurred. One option consists in using a plain controller method that uses the ASP.NET MVC infrastructure to serialize .NET objects to JSON. The other option involves using the Web API infrastructure. Let’s review both approaches, because behind the apparent simplicity lurks a potential problem. The method uses any available logic to capture the list of objects to serialize and then just passed it down to the Json method for the actual serialization. It’s neat, easy and effective; well, sort of. Up until recently, I never ran into any problems with the JSON and ASP.NET MVC. I’m not sure if this was pure luck or excellent forethought on my part, but the fact is that the size of the returned JSON has never been an issue. Well, until recently. The RecursionLimit property indicates the maximum nesting level allowed while serializing a hierarchy of objects or traversing a JSON string during deserialization. Overall, a default value of 100 seems overly safe as no savvy developer would ever bear more than 4 or 5 levels of nesting. The default value set on MaxJsonLength is a bit different and while it hit me personally only recently I could easily find out, on StackOverflow, that this limit had hit many other in the past. There’s just one possible action to take that could solve the problem: raising the threshold of MaxJsonLength. Unsurprisingly, there are many ways to implement that. However, most developers – myself included – love to serialize data via the simple Json method from within the controller method. It works well except that it doesn’t give you any control over the maximum length of the JSON string. At the end of the day, the Json method is only a piece of syntactic sugar set around the constructor of the JsonResult class. By merely calling the JsonResult constructor directly, you gain a lot more control over the available properties. 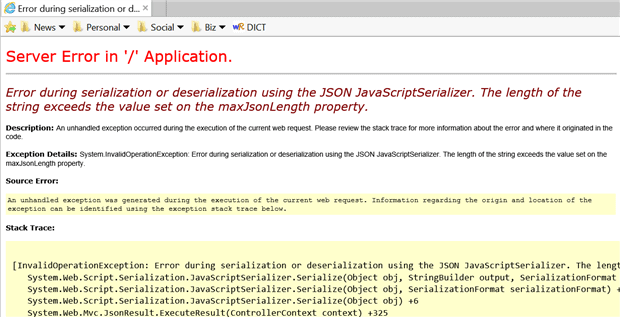 Note that if you decide to handle the serialization yourself, you can’t use JsonResult to wrap up the results for the caller. Once serialized, the original object is just a plain string that you package up using an instance of the more generic ContentResult class. I used the Json method of the Controller class for years and never experienced any sort of problem. Now I believe that I avoided problems only because I managed to keep any JSON chunk of data well below the threshold of 2MB. When I hit the 2MB limit, I could have shrugged and reduced the size of the Json document or increased the limit by altering the code. At this point, though, my natural curiosity took charge and I felt compelled to find out whether 2MB is reasonable threshold, and whether it is reasonable to return more than 2MB of JSON data. Some quick research showed a general consensus was that a current browser could handle up to around 1.5MB of JSON data sets without slowing down or showing side effects. Support for JSON also seems to be quite similar across the entire spectrum of available browsers. A 2MB default threshold therefore sounds as if it is wise choice. So 2MB seems reasonable for a default threshold. Should your application reasonably request more than 2MB of JSON data? While the workarounds discussed so far enable your HTTP service to happily return several MB of data, I’m still convinced that no clients should ask for more than 1.5MB and probably far less. In the context of a plain ASP.NET MVC solution, Web API is an extra cost as it requires the instantiation of an additional pipeline to process its requests. Until the ASP.NET 5 framework becomes publicly available and reliable to use, Web API and ASP.NET applications have different runtime environments. It is only in ASP.NET 5 that you will find that when targeting the .NET Framework Core, ASP.NET MVC and Web API share the same runtime. At that point, though, there will be just one type of Controller class-as opposed to what you have today-that sums up the features of ASP.NET MVC and Web API controllers of today. Particularly where software is concerned, we don’t live in a perfect world. There are many ways of doing things and many shortcuts that sometimes developers use without knowing that it is a shortcut and without being aware of the implicit restrictions. For years I’ve chosen to use the Json method in an ASP.NET MVC controller class without being aware of any side effects, until I eventually lost a night’s sleep while making sense of a weird misbehavior in a production system. There is a similar application limit in web forms or for that matter any asp.net application. You can override it in the web.config file. I encountered this in developing an old-fashioned asmx web service for a company still living in the stone age (using VB.NET). Does overriding this limit in the web.config file also override it for the JSON limit discussed in this article? Newtonsoft JSON is significantly faster eliminating some of the concerns over size even beyond the lack of an obscured limit (and outside architectural bloat concerns), and you can use it independent of Microsoft’s Web API components. It’s been an open source project longer than it has been part of MS Web API. Mvc’s ability to define a ‘generic’ ActionResult means code can be flexible in returning what the caller wants. eg, an input argument for given action method is a Boolean "detail yes/no" – and the code returns either a simpler summary object or a full object. Nice and simple and easy to understand from the client end .. but not possible with WebAPI. Cookie handling is also easier with Mvc. All in all, I’ve also rarely found a reason to introduce WebAPI into an Mvc application (and d*mn the purists). Cheers. 1) If you’re just exposing some data via JSON, MVC is probably all you need (keeping in mind the size limit issue). Web API is really more about building RESTful CRUD endpoints (create, read, update, delete) using the HTTP verbs. Different beast. 2) If you look at the MVC and Web API docs and tutorials, you’ll see the authors often talk about adding MVC to a Web API project to facilitate automatic documentation. Nobody really recommends adding Web API to an existing MVC project to handle JSON requests unless it represents a major new direction for the project. Ok, I dunno… but: Every project I’ve worked on stipulated checking for valid data SIZES as one of the elementary criteria before bothering to sanitize and interpret the actual data. Am I smoking dust here in assuming that it goes without saying that the number of bits is FUNdamental?